Shakti or Serpant power in our body. Even in these three nadis, Sushumna is the most important one. Ida and Pingala represents the two opposite energies present in our body. 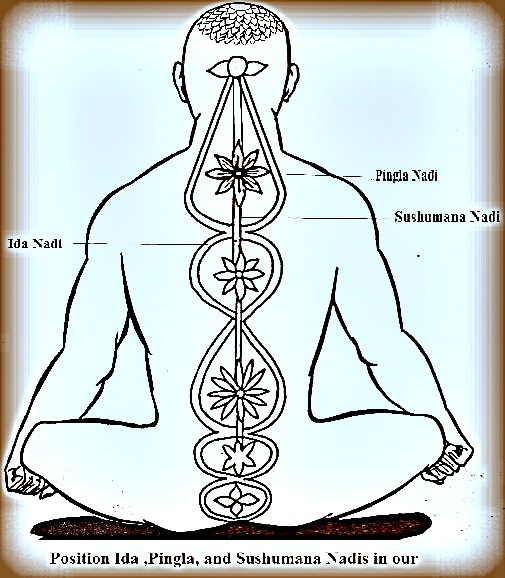 Ida, Pingala and Sushumna all Nadis are meet at the Mooladhara chakra and make a knot there and also currents of Prana which flows continuously through the body. Ida Nadi : Ida starts from the right testicle and posseses passive, introvert, and is also known as “Chandra (Moon) Nadi”. If breath is flowing more through your left nostril, it indicates that Ida nadi is dominating in your body. When your left nostril intakes more amount of breath, it signifies that your mind is more active and introvert. You can perform any mental task with more efficiency in this state. if your ida nadi becomes more active then your digestive system will slow down and you may experience constipation. Sushumana Nadi : Sushumana nadi is the most important among all the nadis. It is also known as brahma nadi. It is analogous to the central spinal cord. It start from the Mooladhara chakra and end at the Sahastrara or supreme chakra.The awakened kundalini rise up through the Sushumana Nadi. All karmic deeds are stored in the central Sushumana Nadi in the form of miniature astral body known as suksham sharira or miniature body.When sushumana Nadi will activate ,there is a visible glow on the face of the person and victory over most of his diseases. Yogi or Sadhak becomes more spiritual and peaceful. This entry was posted in Smart astro guru, Yoga & Kundalini Shakti and tagged brahma nadi, chandra nadi, cool nadi, hot nadi, Ida, Ida nadi, nadi, nadis, Pingla, pingla nadi, Sun nadi, surya nadi, Sushumana, Sushumana nadi by R. N. Sharma. Bookmark the permalink. then i advise him/her to pay a quick visit this webpage, Keep up the nice work.